Two hearts are fooling us (they are upside-down). 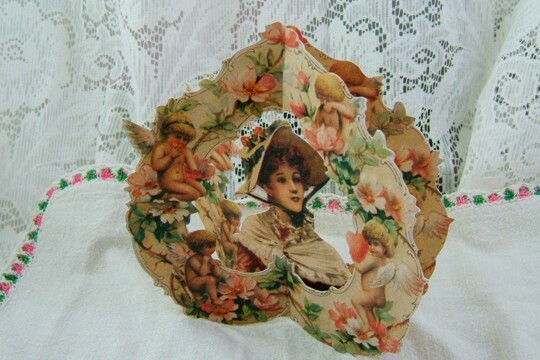 When you open the card, the hearts form a base for a lovely Victorian woman with a fashion bonnet. Cherubs and angels - even Cupid himself - surround her with flowers and vines. This wonderfully made card is expertly die-cut and highly embossed so that you might create a new family heirloom. 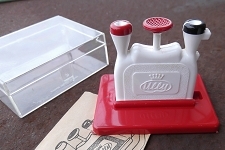 Reproduced from a vintage original, this romantic and fun mechanical card will charm your sweetheart or even your daughter! The traditional To: and From: are on the back base of the card for you to fill in. You might write your own love sonnet on the back. Each card comes with a white envelope and measures about 7 inches high by 7 inches high when flat. When displayed in 3 dimensions, the card is also 7 inches in depth. This larger card may require additional postage.